Award-winning searchable database to help sufferers from cancer understand the different types of chronic pain associated with the disease so that they may take a more active role in it's diagnosis and treatment. 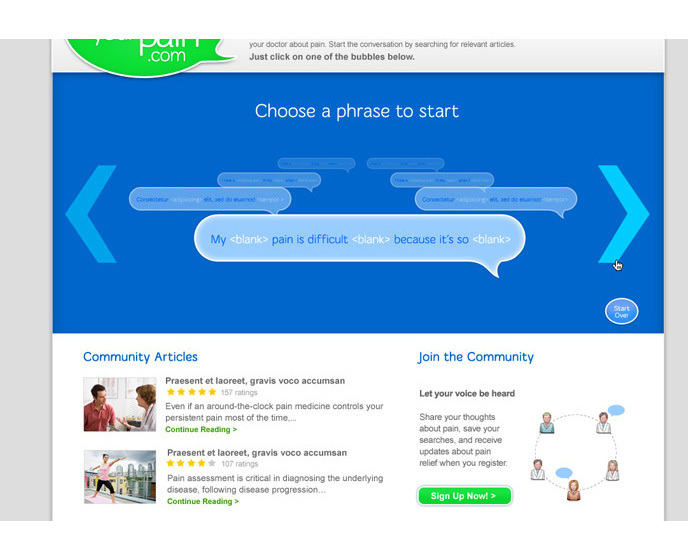 The animated interface allowed the user to search either other users previous searches in the form of talk bubbles or to start their own search (by creating their own "bubble"). The experience was designed to not just provide an effective way of using digital to gain knowledge but to also help the user feel connected to a community of people in the same struggle. 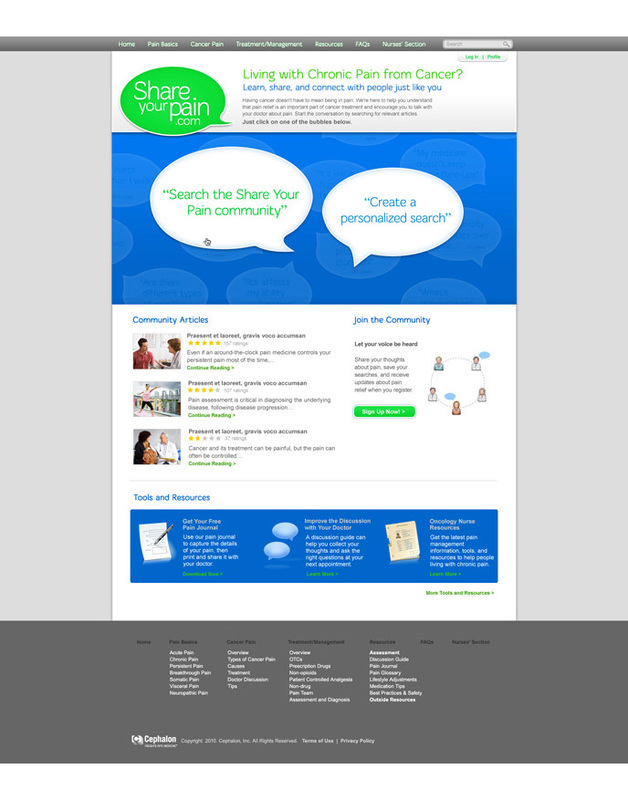 Homepage:The user chooses between searching the community or a personalized search in the animated marquee area. Animated Marquee: By moving the mouse, the user searches the talk bubbles for a description similar to their symptoms. Clicking on a talk bubble opens additional bubbles that allow the search to be more specific. On rollover the user gets teaser information and the number of related articles are indicated. The use can go back at anytime by clicking on the previous bubbles. Personalized Search: If the user prefers to create a personalized search, a few starting phrases are presented that allow the user to fill in "blanks" in order to create a customized phrase that relates to articles in the database. The user can also choose to share, placing their bubble in the community marquee. 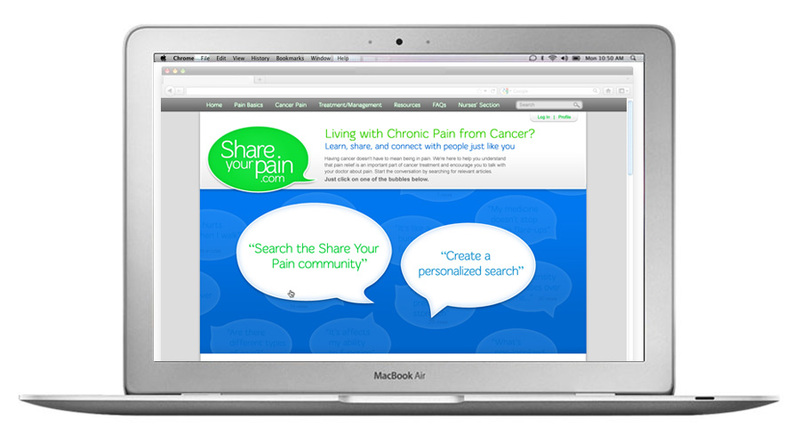 Search Results: Regardless of which path the user chooses, the results are presented with scrollable articles that are indicated as articles on other site or within the ShareYouPain database. The number and level of ratings are present and the articles are shareable. Nurses' Section: The site also features a nurses' area that have articles and tips for treating and discussing cancer pain.